It's nearly the start of summer in the U.S. — vacation time for families and breeding time for mosquitoes, including the one that carries the Zika virus. Dr. Tom Frieden, the head of the Centers for Disease Control and Prevention, says much can be done to prevent the spread of Zika in the U.S., particularly in the south, if Congress would only provide the money. "We need a robust response to protect American women and reduce, to the greatest extent humanly possible, the number of families affected. We don't know who those children will be. We don't know where they will grow up, but anything we don't do now, we will regret not having done later," he said. Frieden and other top doctors say Zika would not be a major threat except that it causes serious birth defects, including microcephaly, which literally means "small head." "When a child is born with microcephaly, it's not because the skull was malformed, it's because the virus destroyed the brain cells, and the skull collapsed around the demolished brain," Frieden said. FILE - Severina Raimunda holds her granddaughter Melisa Vitoria, left, who was born with microcephaly and her twin brother, Edison Junior, at the IMIP hospital in Recife, Pernambuco state, Brazil, Feb. 3, 2016. Some lawmakers say there's no evidence the virus will spread in the U.S. like it has in Latin America and the Caribbean. Dengue, a similar virus, has spread in the southern part of the western hemisphere, but, aside from a few cases in Florida and Texas, it has not spread from one person to another in the U.S.
That's small comfort to Dr. Peter Hotez, a pediatrician and chief of the Baylor College of Medicine National School of Tropical Medicine. "Microcephaly," he said, "is every parent's worst nightmare." In early February, U.S. President Barack Obama asked Congress for $1.9 billion for emergency funds to fight Zika. Before Congress left for a spring break in late May, it had not allocated any money, although the Senate has approved $1.1 billion toward mosquito extermination and research, including the development of a vaccine, and the House has agreed to $622 million. Some congressional leaders have called the request "a slush fund." Frieden told reporters that a three-month delay in funding an epidemic can cause it to grow exponentially. He defended his agency's requested budget and said that, in the interim, the CDC has been forced to take money away from programs to fight Ebola in West Africa, and from the states' emergency funds that provide health services to victims of flooding and other catastrophes. 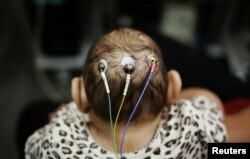 FILE - Five-month-old Laura undergoes a medical test at the University of Sao Paulo (USP) in Sao Paulo, Brazil, April 28, 2016. Dr. Edward McCabe, medical director of the March of Dimes, told VOA, "My concern is that people won't start getting worried about Zika virus in the U.S. until we start seeing babies with microcephaly and other birth defects." Since February, top U.S. doctors have pressed Congress for Zika funding. Frieden and the head of the National Institute of Allergy and Infectious Diseases, Dr. Anthony Fauci, have testified before House and Senate committees about the need for emergency funds to fight Zika, as have others. In April, the CDC held a summit with state and local officials ahead of the virus' anticipated arrival in the U.S. Doctors from various organizations representing city, county and state public health agencies have made the point that they lack the money to wage an effective fight against the Zika virus. Frieden said the greatest emotion he feels about preparing for the Zika virus is frustration. "Imagine that you're standing by and you see someone drowning, and you have the ability to stop them from drowning, but you can't. Now multiply that by a thousand or a hundred thousand. That's what it feels like to know how to change the course of an epidemic and not be able to do it," Frieden said. When Congress returns from a two-week break June 6, the debate over Zika funding will continue.